About Me | لماذا غزة؟ Why Gaza? Lora A. Lucero is a community journalist, climate change educator, land use attorney, city planner, community gardener, mother and grandmother. 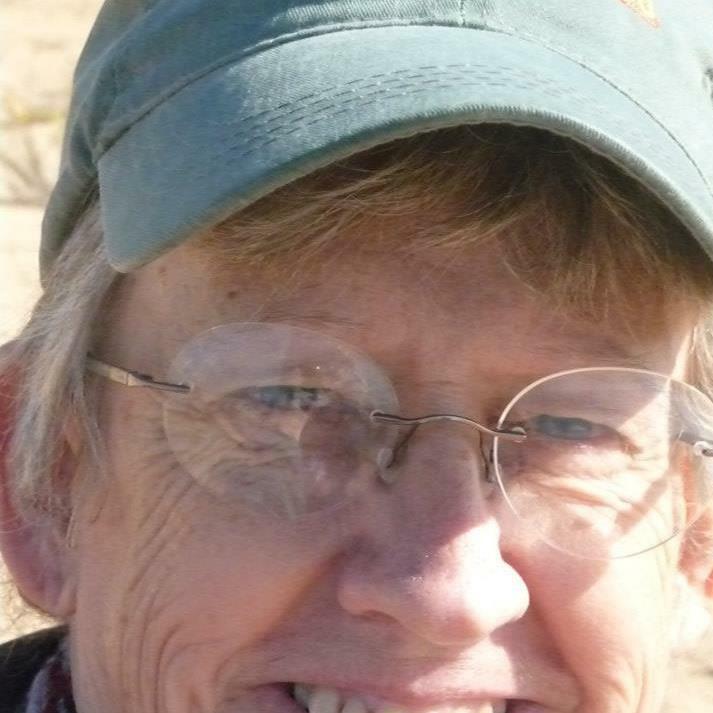 Her home is in Albuquerque, New Mexico, USA. Lora traveled to Gaza in September 2012. She taught a climate change seminar to environmental engineering students, lived with Palestinian families and made many friends. Returning to the USA in June 2013, she is now writing about her experience. Answering that question is not so easy. This blog is an attempt to begin the process of answering that question. 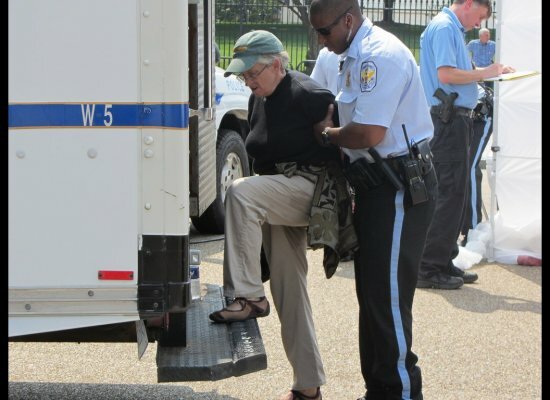 Lora Lucero arrested in front of the White House in August 2011 protesting the Keystone XL pipeline. Why is Gaza occupied? Why is Gaza seemingly hidden from view? – at least for many Americans. Why is Gaza “off-limits” as a travel destination? – at least according to the US Embassy in Cairo. Why is Gaza seemingly the epicenter for conflict and strife in the Middle East? Why is Gaza so misunderstood by so many Americans? These and many others questions will be shared in this blog, along with the journey to find some answers. Lora has an invitation to return to Gaza, but has been unable to get permission from Egypt or Israel to cross into Gaza. The U.S. Embassy in Cairo refuses to assist travelers to Gaza as well, but she won’t give up. Hope this email note reaches you and that you have a chance to look at the site. Your comments, critique and feedback are welcomed. I also saw in your bio that you were hoping to return to Gaza last year….did you make it….. It would be excellent to talk about a possible collaboration on some level. You’ve heard nothing about Max Blumenthal’s book because rightfully so, he’s finally recognized as a anti semitic, self loathing Jew who consistently misrepresents the facts. No mainstream media is interested in him anymore. If they were, you’ld see much more about his book. A couple weeks before Lensic he gave a speech in London preceded by an avowed white supremacist. His speech as reported in the press and confirmed by other media contained many inaccuracies. Furthermore, while I have no issues with him or anyone else supporting the Palestinians, Max never takes Hamas to task. He never had a single criticism of any action taken in Gaza during the conflict this summer. Not one, yet criticises everything involving Israel. (review his Twitter stream) Even many Arabs were critical of Hamas, but not Max. He has no balance what so ever. One must be honest if putting oneself out as an “expert”. He can invent catchy acronyms like PEP to explain away his critics but really it’s his own messages and absolute hatred that’s his problem. Not others. For (hopefully relevant) thoughts of mine on this and that, see Swans Commentary Letter 239 and also Killing The Buddha, December 8, 2010. And I hear Gaza, and all I can think of is “… and the rockets red glare…” If Gaza had been anyplace else on earth, it would have been eradicated by now. Praise Allah they have to live next to the Jews. Imagine if Bashir Assad was next door. Yes we heard from Fadi immediately, and he visited the family and connected them to Al Shifa and to Susan, who is now Yasser’ss pediarician. And thanks to Fadi. and to a wonderful doctor. (Mohamed Abouhemeid who was visiting in Canada and heard about him from our friend Dr Ghada Azeel) little Yasser is now regisered for tests in Al Shifa Hospital, and able to get the assessment he needs, Finally something positive.. Please let me know if you do not hear from my friend in Gaza within 2-3 days. He said he would send you contact information for the doctor at Shifa. I gave him your email address. I’ve given your message to a friend in Gaza who may help you with your connection. Brava, Brava, Lora Lucero! I’m a San Francisco Bay Area-based Palestinian solidarity activist who loves your blog. I’m also a former Albuquerque resident (1965-1984) who loves that your current home is my former home. ¡Muchísimas gracias! Thanks for what you are doing. Wish you good luck and safety. Tell your students and other Palestinians that Americans and Jewish groups are against what the government of Israel has done and is doing to them. They, both government groups, need to “Wage Peace NOT War”. I live in Albuquerque, NM. Thank you for sharing, we can only imagine the grief our Palestinian brothers and sisters may be going through right now.